Once upon a time I really enjoyed the #100PeopleInAWeek challenge so it just seemed natural to say that I was up for the challenge this year. To be completely honest, I don’t know what I was thinking as I’m struggling to draw anything right now and am grateful for the occasional day when arthritis takes a break and I can hold a pen. When April 8th rolled around, we citizens of Quebec were blessed with a raging blizzard. Such storms raise havoc with my arthritis, but I gave people drawing an effort. I got a few drawn but I just couldn’t concentrate because my hand hurt so much. Seems after 10-15 minutes the pain increases. So I had to stop. So…after day one I was 11 people behind schedule. 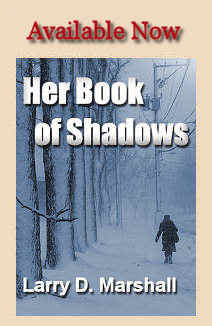 The next morning we were facing blizzard conditions again and the barometric pressures were bouncing up and down. I was supposed to sketch with friends and so I went to the rendevous, though I was having difficulty walking and my left hand (the important one) was throbbing. We were drawing windows in the mall and I got halfway through a shaky drawing before I gave up in frustration. And today…I can hardly hold my pen. So… on day three I’m 41 people behind. I’m a slow learner but even I have figured out that attempting this challenge, this year, is a fool’s errand. Next year. 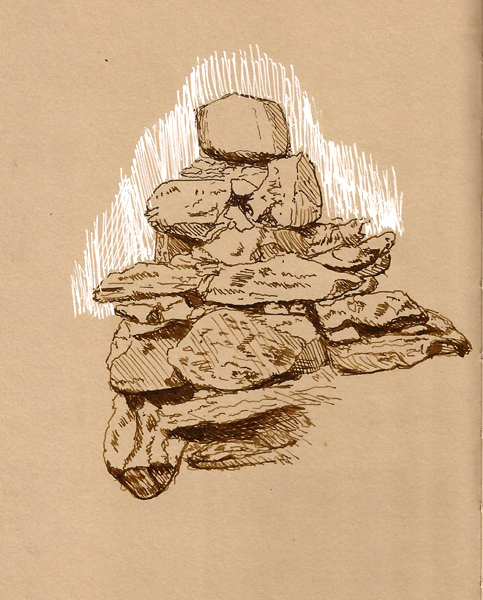 Inukshuks are common across northern Canada. Seen principally as a product of the Inuits, other Native American groups also make them. They are said to have been used as navigation markers, or markers of significant locations. They commonly represent of Canada itself and some have deemed them a symbol of hope. You can buy tiny inukshuks as souvenirs, sold right next to the beaver and moose figurines. In any case their structure is meant to represent a human form and larger ones even have legs and arms. Most have outward projections that represent arms in some way. Mostly, though, they are a pile of rocks and I love drawing rocks. We were at the museum the other day and in the Native American exhibit there is a small inukshuk that sits behind some large display cabinets. You can see all of it if you’re standing in front of those display cabinets but I had to sit across the aisle from them so I would have light to see my paper. This meant that I couldn’t see the bottom half of it. I drew it anyway, direct with ink, and this is the result. 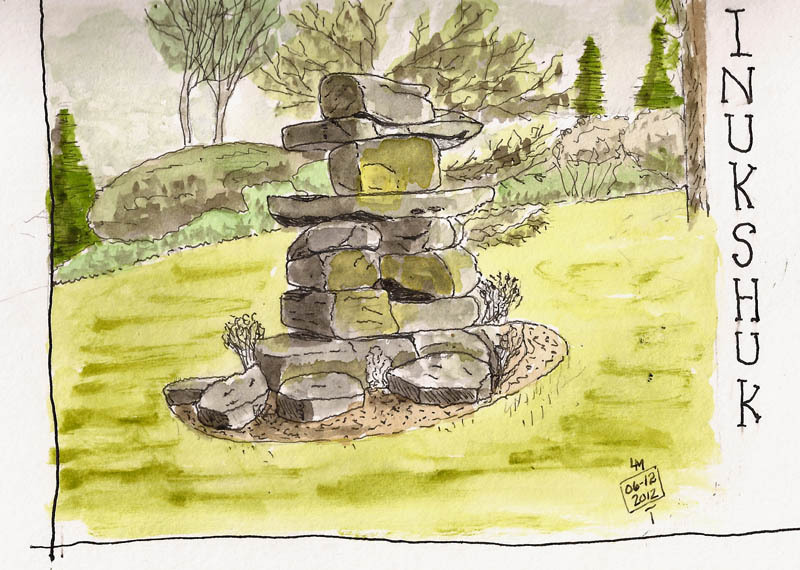 I really had fun drawing this inukshuk and I remembered that I’d drawn one before, an inukshuk that resides on the Quebec Parliament grounds. I decided to see if I could find that sketch. I rarely look at my old sketches but I did find it and I learned a couple things. First is that this older sketch was done in 2012, only a few months after I decided to learn how to draw. The second thing I learned is that I have actually improved as I’ve accumulated pen miles. That made me happy. Maybe inukshuks do represent hope. It’s BACK!! Marc Taro Holmes and Liz Steel are, once again, leading the challenge to draw 100 people in five days. I’m not a people sketcher but I did this last year and it was a lot of fun. 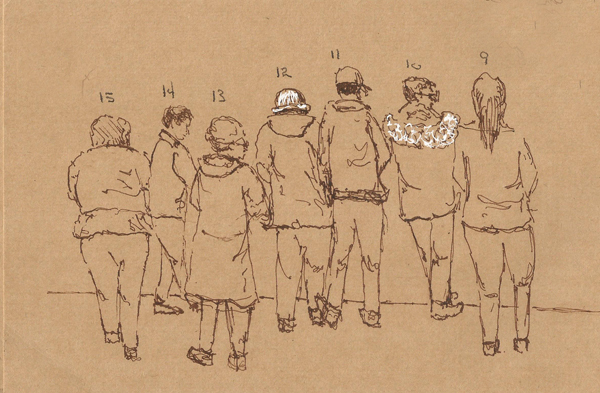 My advice is to set aside Monday and, draw, draw draw 30-40 people. This makes the rest of the week easier as you’re less likely to fall behind and get stressed (grin). 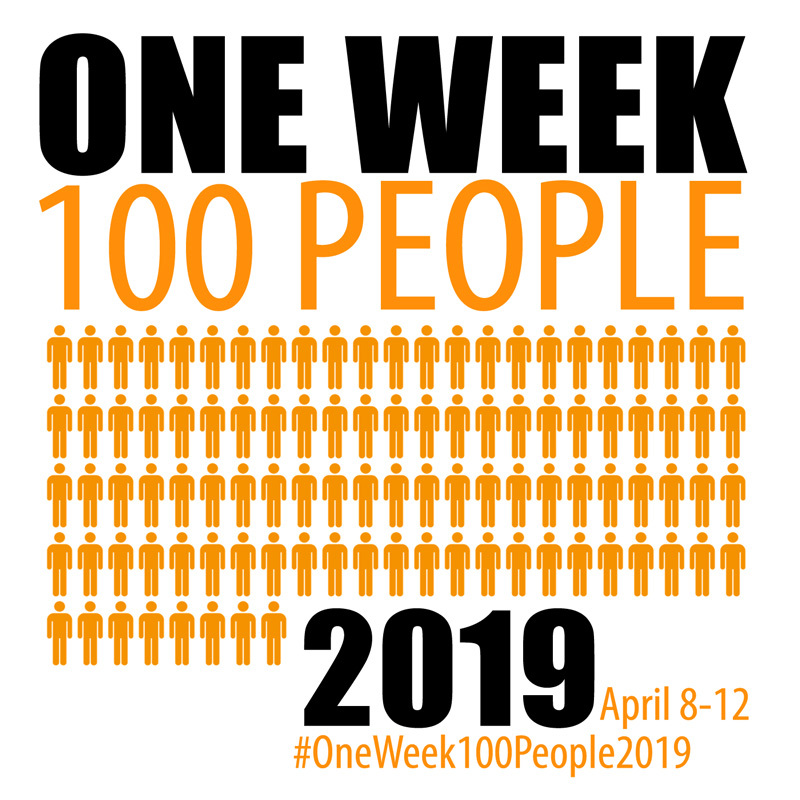 Then, post your results with the tag #oneweek100people2019. 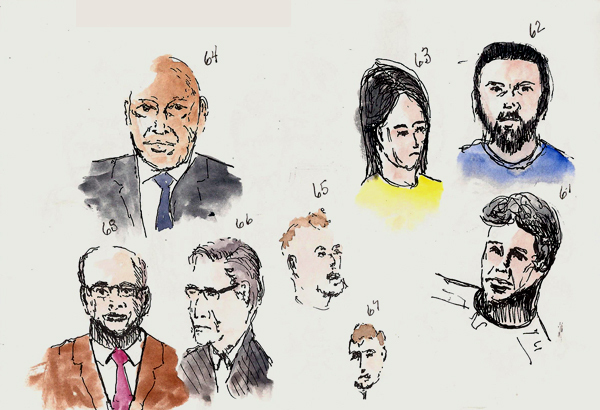 To demonstrate some ways of achieving the goal, here are some examples of how I drew 100 people. 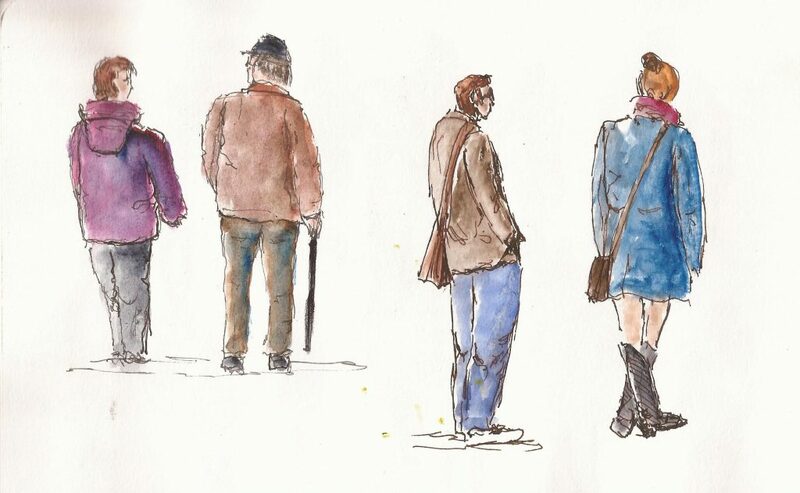 None of these people captures took more than a minute or so (adding color not included) because these were real people, doing real things and they didn’t wait around for me to draw them (grin). These were captured one at a time as they ordered coffee. 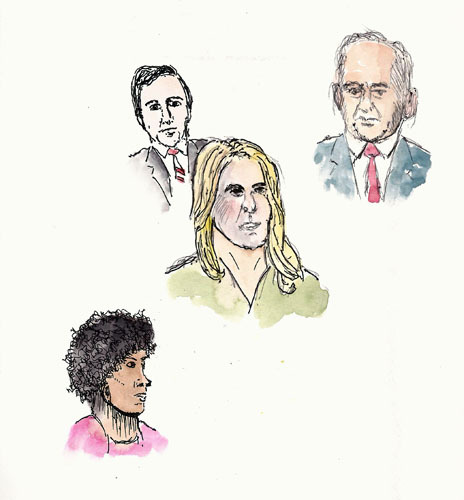 These floating heads were gleaned from TV. These were people standing around in the mall. Long before Sesame Street, baby boomers cheered on puppets of one form or another as they came to our houses via television. Television was new back then and we didn’t seem to mind that the shows were goofy, didn’t have any super-heros and not a single explosion upset the simplistic dialog of these shows. Remember Howdy Doody and Buffalo Bob? The people of Quebec didn’t see them, but they had Bobino and Bobinette and I never saw the Bobino show, so never got to see the marionette Bobinette perform. 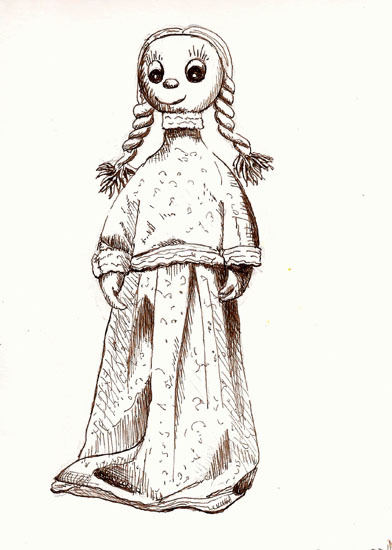 Bobinette now stands in our civilization museum, next to Bobino’s suit coat and bowler hat, and while a blizzard was dumping yet another foot of snow on us, I drew her. I probably should have used color to show off her pink dress and big blue eyes but I settled for a Pilot Kakuno and a brown/black mix of DeAtramentis Document ink. I hope she’ll make you smile. We need more smiling these days. My brain is rusty. While I’m still having trouble with my drawing hand, it’s my brain that has fallen out of practice and needs some line miles to return my sketching to the miserable quality it once was. So when Yvan and I made another trip to the hunting an fishing museum I was determined to make a lot of lines. 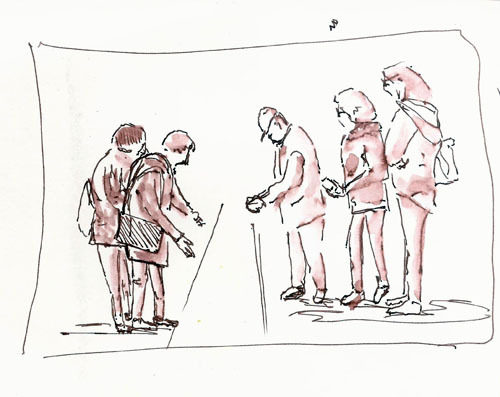 Instead of trying to create a detailed, well-proportioned drawing, I decided to sketch quickly (for me) so I could cover more ground – make more marks. No pencil block in, no holding my pencil out to get proportions. 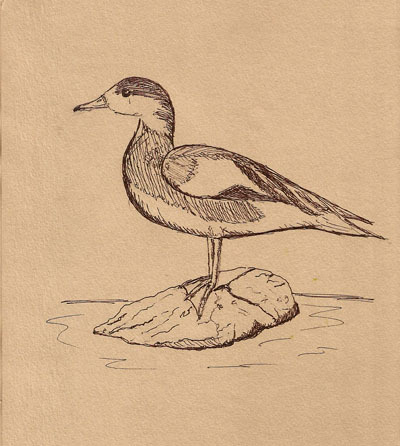 The goal was to make lines – lines that, hopefully, would look something like a duck. Here’s what I managed to put to paper. 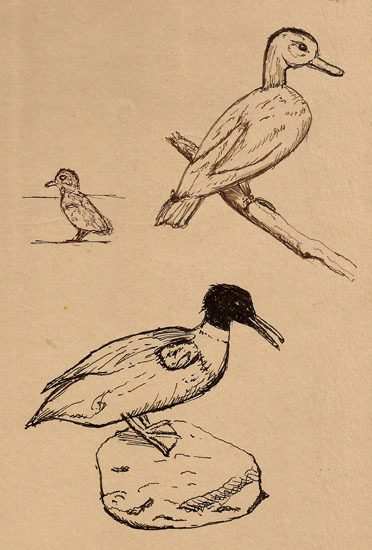 Errors abound, of course, but they do look like ducks and generally they look like the ones I was looking at. I label this a success with the caveat that I need to do a lot more of it to get my lines to flow better. 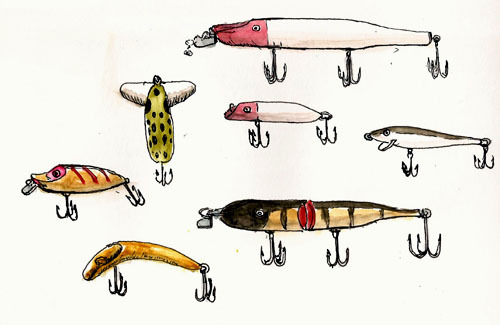 After a short break I decided to do the same thing with a bunch of fishing lures. The drawing here was pretty “sketchy” (pun intended) so I added some color to add some life to the spread. We say all the time that it’s the process, not the product. Getting back into sketching is reward enough for me. 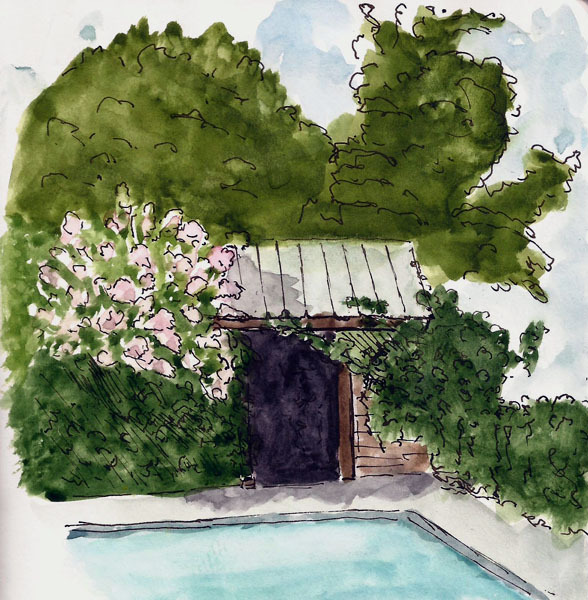 I Went Sketching – Yippee! As I look out my window I can only barely see the house across the street. This is because we’ve got a rip-roaring blizzard going on. This winter has been a doozy thus far. We’ve already had 11-12 feet of snow and it’s only mid-February. Many of us have gotten some chuckles listening to the people in Seattle and Vancouver try to deal with snowfall and I include myself among them. Sure, they’re not used to it, aren’t equipped for it, and are even somewhat surprised by the snowfall, I suppose, but it’s fun to poke fun at them nevertheless. I’m just glad they took some snow off our hands as we’ve got so much my snowblower is having a hard time throwing the snow to the top of the snowbanks that line my driveway. But it wasn’t snowing on Monday and Yvan and I headed for the Quebec Federation of Hunters and Fishermen offices. They have an amazing exhibit of taxidermy animals and it’s a delightful place to sketch. My hand was hurting a bit, but my real problem was that I’d lost my ability to “see.” Nothing was automatic and I struggled to see the shapes and volumes of the coyote skull I decided to draw. I should have chosen something more simple. I guess I should have known that “out of practice” would include all aspects of drawing, but I figured that once I trained my brain, it would stay trained. 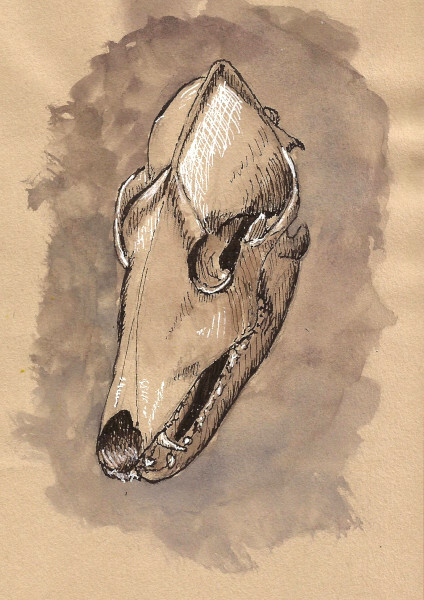 Then again, I forget where I put my keys so… Anyway, here’s my version of a coyote skull, which has an eye socket drawn way too small. I took a short break to get a drink and rub my hand a bit. 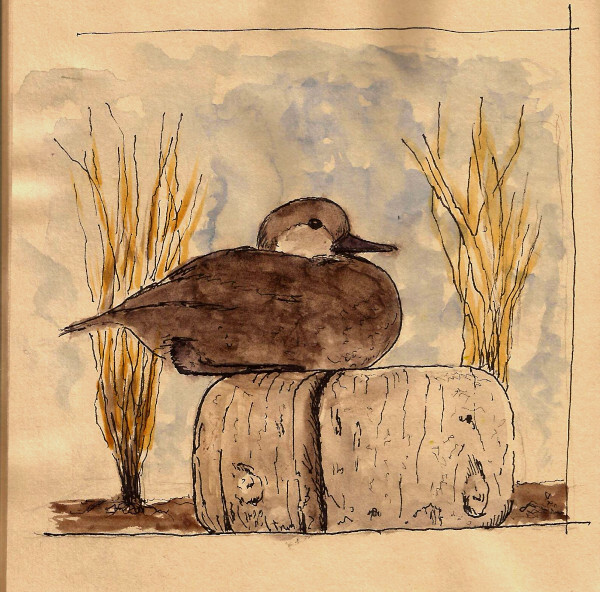 Then I sat down to draw a duck. I felt a bit more confident by this point and I didn’t need to second guess myself so much. We’d decided to stop at noon for lunch and so I rushed a bit to finish this one but I was happy, and a bit tired. We ate lunch with the idea that we would return to sketching but we didn’t. My hand was hurting and Yvan suggested that we call it a day since it was my first day back to location sketching. Instead, we decided to go have coffee where we talked about composition, tactics for blocking in drawings and identifying simple shapes in a scene. We topped off the day with a stop at an art store and then I got to look over a bunch of Yvan’s art. The day couldn’t have been more perfect. The days are becoming cool and raining and between that and days when my hands won’t let me draw that coincide with the good days, I’m not getting a lot of opportunity to sketch on location. But Yvan and I did get out and into the alleyways of old Quebec to do a bit of sketching. This, and the smile on my face, was the result. 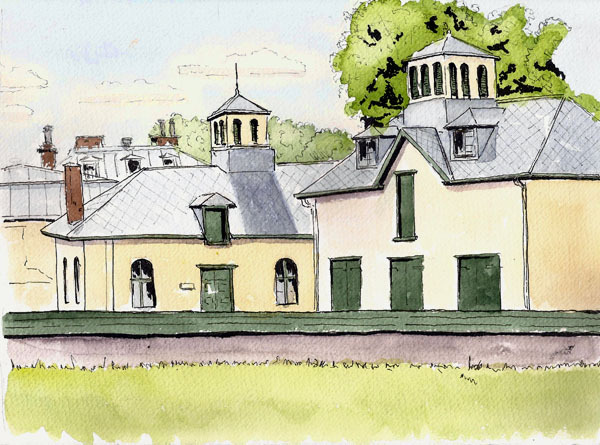 The Artistes dans les Parcs leader, Denise Bujold arranged for us to spend a Thursday sketching at a winery on the Ile d’Orleans, not far from Quebec City. She surprised us by using her superpowers to give us ideal weather as well. 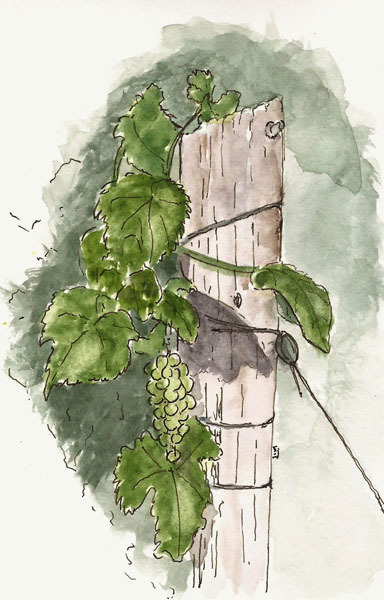 There were sixteen of us scattered around the winery, drawing, painting or enjoying each other’s company. It was quite a day. 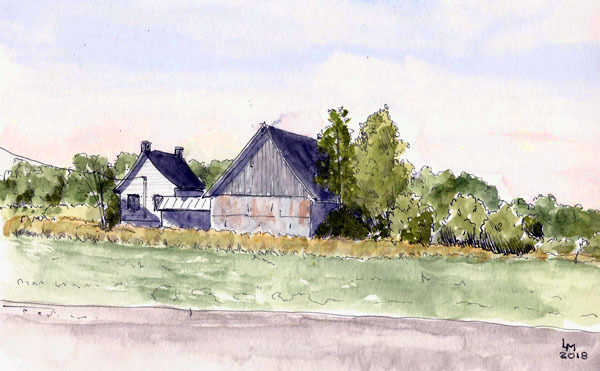 I decided to draw this scene, not part of the winery but across a field from it. I was disappointed that I didn’t get more depth into this sketch. We all took a break for lunch, sitting at some picnic benches available for visitors to the winery. The sun was so inviting that I wanted to lay down in the grass and fall asleep. Ah…to be a kid again where that wouldn’t be seen as rude (grin). Rejean had done a small vignette of a cluster of grapes and I decided I needed to do one too. I have a tough time walking down hills right now but I found I could walk along a road that wound its way around some buildings and served as a way for tractors to get to the lower level. Eventually I got to the head of one of the fields and found a cluster of grapes near an end post, creating an ideal subject. I was pretty happy with the result and the entire day. Denise Bujold is doing an amazing job of organizing events for us to attend. While most art groups are held together by the love of a particular medium or way of working, this one is held together with smiles. It seems everyone is working in a different medium, some carry easels, others tripod stools. But everyone shows up with smiles on their faces and that’s all we need. 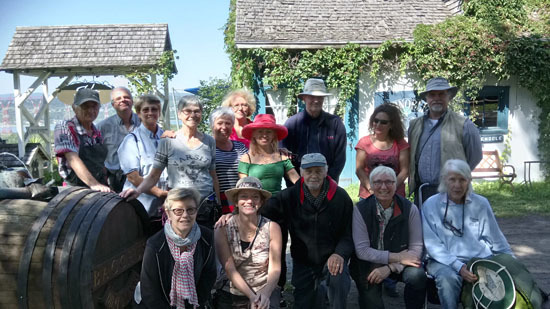 This week we assembled at Domain Cataraqui, which at one time was a huge estate. I guess it’s still a huge estate but now it serves several purposes, most central of which is a cooking school. 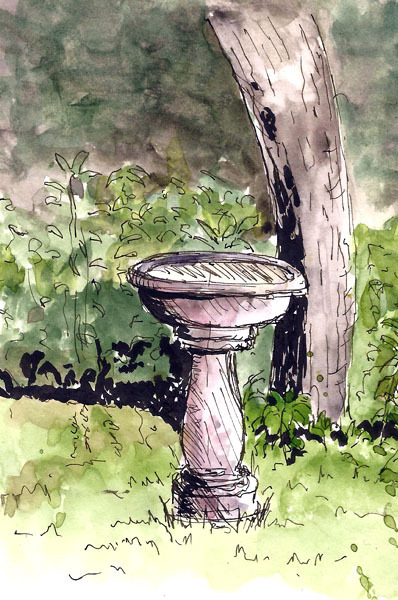 For a sketcher, there is a large cluster of unique architecture and gardens that are all surrounded by forest. Oh…and it’s quiet, one of my favorite things. Yvan and I arrived a bit early and we chose an area to start sketching. I decided to do a larger sketch of a view of the building complex and because I’m slower than molasses as a sketcher, it took me until lunch to complete it. Everyone else had set up and were painting on the other end of the estate so I headed up there to take part in the smiles, some chit-chat, and maybe some lunch. It was a gorgeous day and sitting in front of a multi-million dollar mansion just felt right. When faced with opportunity, a sketcher shouldn’t hesitate and Yvan and I are no exceptions. 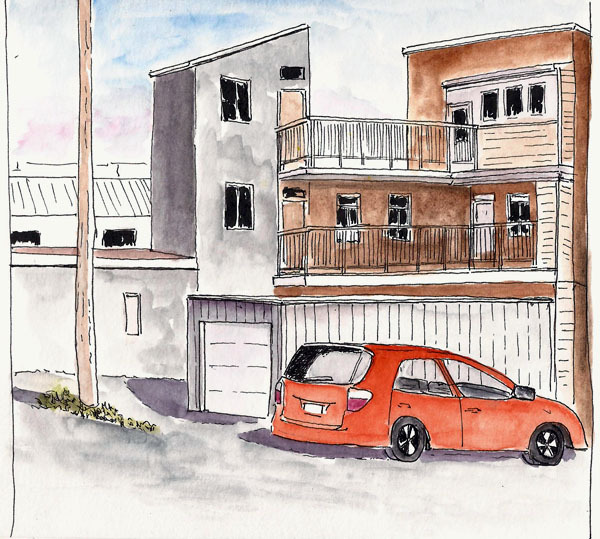 Miriam invited us to sketch at her place on Ile d’Orleans and we jumped at the chance. The location is beautiful and Miriam is there to sketch with us. What’s not to like? The day was delightful, though my hands seemed to have a mind of their own. These days, straight lines are becoming hard to make. But we had a lot of fun sketching together and enjoying the day. Here are a couple of my sketches from the day.